Emergency Service Zones represent the defined geographic service area of a unique combination of police, fire and emergency medical services (EMS) responders. In the current State 9-1-1 system, there is a unique combination of police, fire and EMS that respond to any given location. Each unique combination of services is represented by a distinct Emergency Service Number (ESN). The ESN is linked to a set of numbered address ranges on street segments for every community in the Commonwealth in a table called the Master Street Address Guide (MSAG). The Emergency Service Zone (ESZ) polygon layer is a geographic representation of this assignment. The ESZ polygons are aggregated from tax parcel data (using the addresses found in the tax lists) and from the official town boundaries of the Commonwealth. The boundaries were reviewed with each community and the coverage was changed based on input from individuals from the respective towns. Because of differences in available resources and appointment of responsibility, the review process varied. Participants who often took part in the review included Police and Fire Chiefs, 911 Liaisons as well as other members of town. 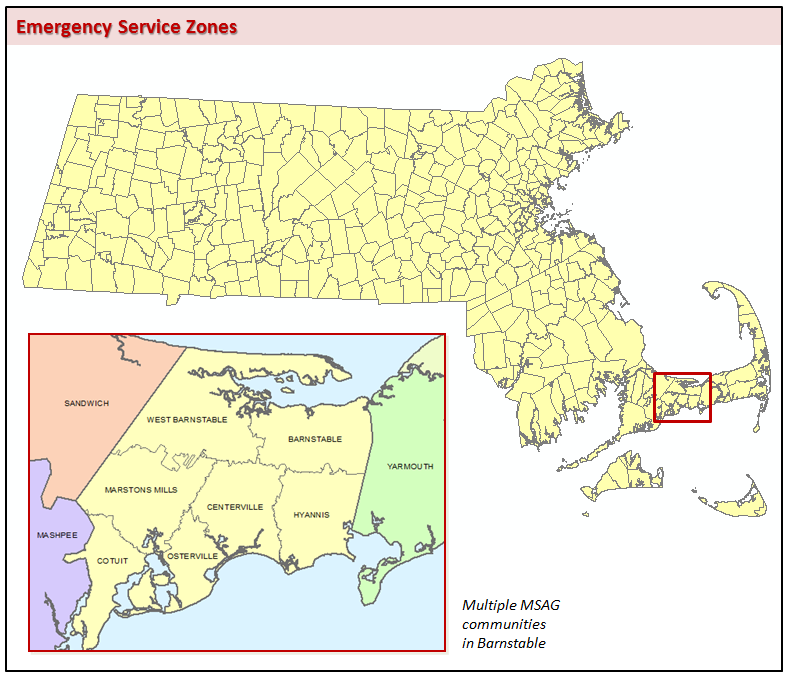 This layer, named MAD.MAD_EMERGENCY_SERVICE_ZONES, was developed in anticipation of the Next Generation 9-1-1 requirement to route calls to Public Safety Answering Points based on the geographic location of the caller. A shapefile export of the spatial view MAD.MADV_EMERGENCY_SERVICE_ZONES is distributed to the public. Emergency Service Zones are polygon features that represent the defined geographic service area of a unique combination of police, fire and EMS emergency responders. The process for creating these polygons was essentially a matching exercise between the MSAG and parcels for a given town. Streets names were compared and parcels were selected where the street name matched and the parcel address was within the MSAG range. Areas of ambiguity, where the parcel address did not match an MSAG range or value exactly, were assigned an ESN based on an individual evaluation. The age of the parcel data used varied by town. The polygons for the towns that have no MSAG community are usually identical to those in TOWNSURVEY_POLYM (multipart version of the Mass. Survey Towns, TOWNSURVEY_POLY) except where specific overlap/underlap situations have been identified. These situations occur because of physical access or other issues, where the parcel is not actually within the legally defined boundary of the responding community. Also see the MSAG Communities data layer and learn about MassGIS' Master Address Database. TOWN NVARCHAR2(21) Official town name. Value determined by the geographic location of the ESZ polygon relative to towns. TOWN_ID NUMBER(5) Unique identifier for towns. Corresponds to the Town value. MSAG_COMM NVARCHAR2(20) Master Street Address Guide (MSAG) Community name. Value determined from a tabular lookup from parcel addresses to the MSAG. ESN NUMBER(5) Emergency Service Number (ESN). Defined as a three to five digit number representing a unique combination of emergency service agencies (Law Enforcement, Fire, and Emergency Medical Service) designated to serve a specific range of addresses within a particular geographical area, or Emergency Service Zone (ESZ). The ESN facilitates selective routing and selective transfer, if required, to the appropriate PSAP and the dispatching of the proper service agency (ies). PRIMARY_PSAP NVARCHAR2(100) PSAP name obtained from MA911. PSAP_ID NVARCHAR2(6) PSAP identification number assigned by the FCC. EDIT_DATE DATE Date polygon last edited. The GIS data described and linked to from this web page (“the Data”) are provided "as is" and the Commonwealth makes no warranty, representation, or guarantee as to their content, accuracy, timeliness, or completeness. The Commonwealth assumes no liability for: 1. any errors, omissions, or inaccuracies in the Data; or, 2. any decision made or action taken or not taken by anyone using or relying upon the Data. The burden for determining accuracy, completeness, timeliness, and fitness for the intended use rests solely on the user. By downloading the Data, the user acknowledges and accepts its limitations, including the fact that the Data is dynamic and is in a constant state of maintenance, correction, and update. To the fullest extent permitted by law, any user of the Data agrees to indemnify and hold harmless the Commonwealth from any claim, loss, damage, injury, or liability of any kind (including, without limitation, incidental and consequential damages, court costs, attorney’s fees and costs of investigation), that arises directly or indirectly, in whole or in part, from that user’s use of the Data, including any secondary or derivative use.